While this week is the pinnacle of existence for fans of college basketball, the last seven days were a peak week for connoisseurs of small school college baseball. There were several high profile matchups in D-II and the NAIA (admittedly D-III action was kind of “meh”) which were terrific fodder for the eyes. It was the kind of week where a guy counts his lucky stars his wife gets overly emotionally involved in the impending “The Bachelor” finale and allows you find your own corner of the house to strategically jump from game to game on the internet undisturbed — trust me on that. This week’s upcoming schedule leaves little lacking in potential excitement as well. In both D-II and NAIA the top-ranked team will tangle with a fellow ranked club and there is a plethora of other highly competitive matchups as well. If you start to OD on hoops, jump on the web and find a game; there’s a bunch of them out there. Use the latest and greatest D-II, NAIA and D-III rankings below to find out who the top teams in the nation are. Rankings are based on games through Sunday, March 12. In an anticipated matchup to be recorded in the annals of history alongside Rocky Balboa and Ivan Drago’s Christmas Day bout, The Undertaker and Mankind’s ’98 Hell in a Cell match and Jimmy “B-Rabbit” Smith Jr. taking on Papa Doc and the members of Tha Free World at The Shelter club in 2002, USC Aiken took on defending national champion Nova Southeastern. In the first game of the series the Pacers overcame a two-run deficit in the bottom of the ninth inning to usurp the Sharks 11-10. The winning run was scored when a pinch runner outran a throw from right-center field and sent the Aiken faithful exploding in joy. 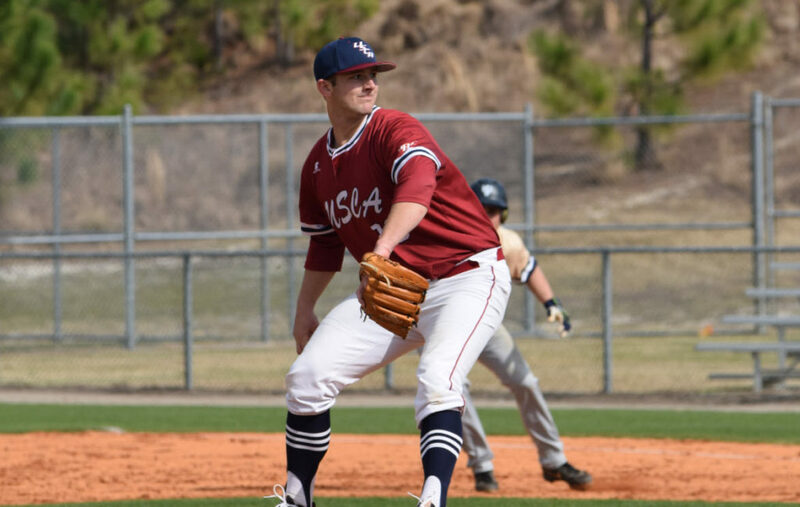 Perhaps still dizzied from the previous night’s defeat, NSU was manhandled in game two of the series as USCA again tallied 11 runs while holding the champs to three. The Pacers were an out away from the sweep, but NSU’s Jancarlos Cintron delivered a clutch two-out, two-run home run in the top of the ninth inning to salvage the series. While the games were emotional rollercoasters, they did little to affect the rankings. The Pacers and the Sharks simply swapped positions in the rankings. Sharks fans aren’t free unbuckle their seat belts quite yet, not by a long shot; NSU hosts top-ranked Tampa this upcoming weekend. A unorthodoxically big, big jump in the rankings was made by Chico State. The Wildcats have won a dozen games in a row after their third straight series sweep. With the wins Chico moved into the top 10 right behind Point Loma, a team Chico split with to start the season. The Wildcats’ biggest test of the year should come this week against CCAA South Division rival Cal Poly Pomona. While the Broncos’ 13-10 record doesn’t turn any heads, they were a preseason top-five pick stocked with a top-shelf pitching staff highlighted by much ballyhooed prospect Jeff Bain, who is averaging over a strikeout an inning while holding opposition to 2.92 runs per nine innings and a .207 batting average. A series win over CPP will cement Chico’s status as a national contender while multiple wins by the Broncos could demonstrate their preseason projection wasn’t wrong, just a bit premature. The biggest debut of the week was made by the West Texas A&M Buffs who entered at No. 15. Buff pitchers strikingly threw shutouts in three of four wins over a Texas A&M Kingsville club that had entered the series undefeated on the year. The wins set up for yet another dilly of a D-II series this weekend as WT travels to Angelo State to play four games against the seventh ranked Rams. Dropped out: Cal Poly Pomona (11), West Florida (23), Wayne State (25). Oklahoma Wesleyan and Tabor treated NAIA fans to that division top clash this past weekend themselves. While it lacked the drama of the showcase D-II series, it still had plenty of excitement, largely in part due to the masterful performance put on by Tabor’s pitchers. OKWU won the first game of the series by a score of 10-6, but like when Marty McFly was instantly energized after his to-be-father George stole back Lorraine Baines on the Enchantment Under the Sea dance floor, Tabor immediately came back to life and took the series by impressively limiting the Eagles to only a single run in games two and three combined. The Blue Jay pitching performance is even more eyebrow raising when you consider that Wesleyan is in the top 10 nationally in slugging percentage, batting average and runs scored (among other categories). While the losses didn’t move OKWU from their fourth-ranked position, the wins did give a 1.21 gigawatts charge to Tabor who jumped into the top 10. Anticipate both teams to stay in the top 10 unless the wheels completely fall of their wagons. Georgia Gwinnett hosted a tournament which consisted of themselves and two other top 20 teams. The Grizzlies traded wins and losses with Lewis-Clark State and Indiana Tech at the invitational, which did little to resolve which team was the best of the bunch, but it did further establish that each of them had top-tier talent on their rosters. GGU lost two games to the defending national champion LCSC Warriors, but they were able to stymie rapidly rising Indiana Tech. Lewis-Clark had their aforementioned pair of wins over Gwinnett, but they dropped two games to Indiana Tech. If the tournament were played again this week it wouldn’t be a bit shocking to see a complete reversal of each of the decisions. Once the dust was settled, the biggest benefactor of the results were the Warriors from the Hoosier state who moved up a half-dozen spots to 13th. Entering the rankings for the first time this season is Webber International. Their inclusion, along with previously mentioned LCSU, Indiana Tech and Westmont, give the NAIA a quartet of Warrior mascotted clubs. Webber has entered the Top 25 with a quantity of wins rather than quality as their record is a whoa-inducing 20-3. They won seven games last week, but none were against a team in the neighborhood of being ranked. Nevertheless, their résumé isn’t void of highlights. They had a series win over a respectable Rio Grande club last month and split two competitive games against Bellevue. Webber will have a monster opportunity this week to show they’re too legit to quit when they host top-ranked Keiser for three games. Dropped out: Missouri Baptist (18), The Master’s (21), Jamestown (25). The outcomes in D-III weren’t particularly compelling with few upsets or games of note. The top nine teams remained the same and relatively little jostling was done with the rest of the Top 25 rank and file. The biggest move of the week was by Occidental who re-claimed their position in the top 15. After starting the season positioned at No. 13, the Tigers had a irksome start to the year and quickly fell into the limbo realm of ‘others receiving consideration.’ However Oxy has won their last seven, capped by a double dose of double-digit scoring wins over Southern Vermont over the weekend. If the Tigers are winning games without clicking on all cylinders, it’s spooky to think what Devon DeRaad and company can do once they get into a groove. Unfortunately it’s only a single game matchup, but Oxy has a blue-chip challenge with a much-better-than-average-but-not-super-good Ithaca College this upcoming Saturday. The Centenary Gents are continuing to torture opposing pitching this season. With their three wins over the weekend the team is averaging 16 runs a game in their last nine matchups. The end of the season has UT Tyler and Dallas on their schedule so it will be interesting to see how Centenary competes against teams of a high caliber. Dropped out: St. Scholastica (18), Cal Lutheran (21), Frostburg State (22).